"Wicked Witch" redirects here. For the stock character in fairy tales, see hag. For other uses, see Wicked Witch (disambiguation). The Wicked Witch of the West is a fictional character created by American author L. Frank Baum as the antagonist in his classic children's novel The Wonderful Wizard of Oz (1900). In Baum's subsequent Oz novels, it is the Nome King who is the principal villain; the Wicked Witch of the West is rarely even referred to again after her death in the first book. The witch's most popular depiction was in the classic 1939 film based on Baum's novel, where she was portrayed by Margaret Hamilton. Hamilton's characterization introduced green skin and this has been continued in later literary and dramatic representations, including Gregory Maguire's revisionist Oz novel Wicked: The Life and Times of the Wicked Witch of the West (1995) and its musical stage adaptation Wicked (2003), the 2013 film Oz the Great and Powerful, and the television series Once Upon a Time and Emerald City. The Wicked Witch of the West is the malevolent ruler of the Winkie Country. Her castle is described as beautiful instead of being the sinister fortress shown in the movie. In all versions, she is seriously aquaphobic. The Wicked Witch of the West was not related to the Wicked Witch of the East, but leagued together with her, the Wicked Witch of the South and Mombi to conquer the Land of Oz and divide it among themselves, as recounted in L. Frank Baum's Dorothy and the Wizard in Oz. She shows no interest in the death of the Eastern Witch, and all she cares about is obtaining the Silver Shoes which will increase her power. W. W. Denslow's illustrations for The Wonderful Wizard of Oz depict her as a paunched old hag with three pigtails and an eye-patch. L. Frank Baum himself specified that she only had one eye, but that it "was as powerful as a telescope", enabling the witch to see what was happening in her kingdom from her castle windows. Other illustrators, such as Paul Granger, placed her eye in the center of her forehead, as a cyclops. Usually, she is shown wearing an eye patch, however some illustrations show her with two eyes. Most of her power resides in the creatures she controls. She has a pack of wolves, a swarm of bees, a flock of crows, and an army of Winkies. She possesses the enchanted Golden Cap, which compels the winged monkeys to obey her on three occasions. First, the witch commanded the creatures to help her enslave the Winkies and to seize control of the western part of the Land of Oz. Second, she made the winged monkeys drive Oz out of the Winkie Country, when he attempted to overthrow her. When Dorothy Gale and her companions were sent by the Wizard to destroy her, the Witch attacked them with a pack of 40 great wolves, a flock of 40 crows, a swarm of black bees, and a group of Winkie slaves. Each of these attempts were thwarted, but the protagonists are eventually subdued by the Witch's third and final permitted use of the Winged Monkeys. Nevertheless, the old witch cannot kill Dorothy because the girl is protected by the Good Witch of the North's kiss. She therefore settles for enslaving Dorothy, and tries to force the Cowardly Lion into submission by starving him, though Dorothy sneaks him food. Upon seeing the Silver Shoes on the girl's feet, the Wicked Witch decides to steal them, and thereby acquire even more power. When she succeeds in acquiring one silver shoe by making Dorothy trip over an invisible bar, the little girl angrily throws a bucket of water onto the Wicked Witch. This causes the old witch to melt away. The Wicked Witch's dryness was enumerated in some clues before this. Furthermore, when Toto had bitten her, she had not bled; her wickedness had dried her up long ago. Unfortunately, L. Frank Baum did not explain precisely why water had this effect on her, nor did he ever imply that all evil witches could be likewise destroyed. However, the wicked witch Mombi is similarly disposed of in The Lost King of Oz and the wicked witch Singra is clearly afraid of the same fate in the early chapters of The Wicked Witch of Oz. The most likely explanation of Baum making water the Achilles' heel of these witches is the long-held belief amongst major religions that water is effective for purifying the soul and combating evil. The Witch did not carry a broom in the novel, but rather an umbrella, which she uses on one occasion to strike Dorothy's dog Toto. Her nature is a volatile and yet somewhat cowardly one. Despite her immense power, she avoids face-to-face contact with her enemies, and is frightened of Dorothy at first when she sees the girl wearing the Silver Shoes. She is also afraid of the dark in Baum's original story for reasons unknown. For that reason, the Witch never tried to steal the Silver Shoes while Dorothy was sleeping. Despite her fear of water and the dark, the Wicked Witch of the West was one of the most powerful witches in all of Oz. In ensuing Oz books, her power is described as having been so great that even Glinda the Good Witch of the South feared her. In Alexander Melentyevich Volkov's 1939 novel The Wizard of the Emerald City, her given name is Bastinda. March Laumer uses this name for the witch in his novel Aunt Em and Uncle Henry in Oz. Like in the 1939 movie, she is the sister of the Wicked Witch of the East. Sherwood Smith uses this name for a new Wicked Witch of the West in her 2005 book The Emerald Wand of Oz. Gregory Maguire's September 1996 revisionist novel Wicked: The Life and Times of the Wicked Witch of the West takes the familiar Oz story and inverts it, with the Wicked Witch (given the name Elphaba in homage to L. Frank Baum) as the novel's protagonist and Dorothy as a hapless child. The name is retained in the musical Wicked. In the novel The Unknown Witches of Oz, the Wicked Witch of the West is named Old Snarl-Spats. In the comic book series Grimm Fairy Tales presents Oz, the Wicked Witch of the West is named Lynessa. The 1910 silent film The Wonderful Wizard of Oz features a character similar to the Wicked Witch of the West, identified in intertitles as "Momba the Witch" (Compare the character Mombi from The Marvelous Land of Oz). In the film, Momba has an unspecified hold over the Wizard, who promises his crown to anyone who can release him from Momba's power. Momba captures Dorothy and her companions, evoking the events in Baum's original novel, and is destroyed when Dorothy throws a bucket of water over her. Mombi's likeness and costume in the 1914 silent film, His Majesty, the Scarecrow of Oz is based on Denslow's illustrations of the Wicked Witch of the West. 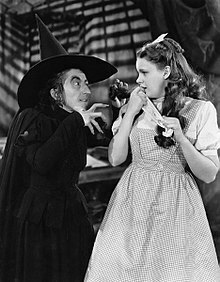 In the 1939 version of The Wizard of Oz, Margaret Hamilton plays the Wicked Witch of the West as a green-skinned witch dressed in a long black dress with a black pointed hat. She does not wear an eye-patch like in the novel. This representation of the Wicked Witch has become a standard for what witches resemble and an archetype of human wickedness. While this relationship is not mentioned in Baum's books, in the movie, the Witch is the sister of the Wicked Witch of the East. The movie makes her even more of a primary antagonist, and consequently she appears in the film much earlier (and more often), than in Baum's original novel. She demands the Munchkins reveal who killed her sister, not long after Dorothy's arrival in Oz. She is described by Glinda the Good Witch of the North, not the South as in the book, as "worse than the other one". She actively seeks revenge against Dorothy for killing her sister, even though it was "accidental". However, as soon as the Witch is reminded of the ruby slippers, all interest in her sister's death vanishes and all she cares about is obtaining "her" slippers, which will enable her to conquer Oz. She is more menacing than her literary counterpart, making Dorothy too afraid to ever lose her temper with the Witch. She makes sure that Dorothy knows her power when Dorothy meets the Scarecrow by throwing a ball of fire at them. Before Dorothy and her friends get to the city, the Witch casts a sleeping spell over a field of poppies through which the group must pass. Glinda remotely counteracts the spell with snowfall. The Wicked Witch then flies on her broom over the Emerald City, demanding that the citizens of the Emerald City surrender Dorothy to her, and the Wizard demands the destruction of the Witch, with her broom as proof, in exchange for granting the wishes of Dorothy and her companions. Unlike Baum's original depiction, the Wicked Witch sends the Winged Monkeys as the first wave of attack. The Golden Cap is not mentioned but, after the failure of her poppy spell, the Witch does hold and then angrily cast away a costume piece that could be considered the cap (It greatly resembles the Cap as depicted in W. W. Denslow's original illustrations for The Wonderful Wizard of Oz) and was mentioned as her "wishing cap" in the original shooting script. She is killed when Dorothy throws a bucket of water on her, in attempt to put out a fire the witch bestowed on the Scarecrow. In the novel, Dorothy simply throws it on her in a fit of anger. There is no prior mention of the Wicked Witch's vulnerability to water in the movie, save for a split-second before the water actually douses her when she screams "Don't touch that water!" (this line does not appear in the film's shooting script). After the Wicked Witch of the West is dead, her soldiers are glad to be free of her power, and quote "Hail to Dorothy! The Wicked Witch is dead!" The character ranks No. 4 in the American Film Institute's list of the 50 Best Movie Villains of All Time, making her the highest ranking female villain, as well as placing 90th on Empire magazine's 100 Greatest Movie Characters of All Time. Hamilton's other role in this film is the Witch's Kansas sepia tone counterpart, Miss Almira Gulch, newly created for the film by screenwriter Noel Langley. She is a socialite who owns half the county. She arrives on her bicycle at the farm and says to Uncle Henry: "Mr. Gale! I'd like to speak with you and your wife right away about Dorothy!" Dorothy's dog, Toto, has bitten her leg, and she wants to take him to the sheriff and make sure he's destroyed. Dorothy calls her "a wicked old witch." Miss Gulch takes Toto away in her basket, but he escapes. In the tornado scene, Dorothy sees Miss Gulch on her bicycle transform into a wicked witch flying on a broom. 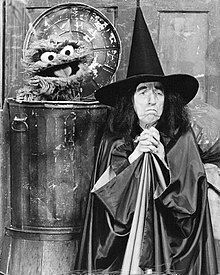 On a 1976 episode of the American television program, Sesame Street, the Witch, once again played by Hamilton herself, drops her broom and falls onto the street and David has the broom and refuses to give it back to her because of remembering who she is and what she did to Dorothy and Toto and knowing what she will do with the broom. In order to get the broom back, she must prove that she can be nice. Everyone is scared of her, except for Oscar the Grouch and Big Bird. After she proves that she is nice, Big Bird is upset when the time comes for her to leave. She reassures him that one day she'll return (only to drop her broom yet again). The episode was poorly received by parents of frightened young children, and was never aired again. The fate of the footage is unknown, but it can be assumed that it is still stashed away in Sesame Workshop's vault. In February 2019, it was announced that over 4500 episodes of Sesame Street over its 49 seasons would be archived in the American Archive of Public Broadcasting. It is possible that “Episode 847” could be included in the episodes being archived, but this is not confirmed. Hamilton also played this witch in The Paul Lynde Halloween Special (1976), and reprised her role several times on stage, most notably at the St. Louis Municipal Opera. Hamilton also appeared as herself on Mister Rogers' Neighborhood three times between 1975 and 1976. In these appearances, she demonstrated how her costume and acting skills made her appear to be the Witch, and assured her young viewers that there was nothing about her to be feared, because her portrayal in the film was only make-believe. The story line of the stage adaptation "goes far afield" from the 1996 novel. As Winnie Holzman observed in an interview with Playbill, "It was [Maguire's] brilliant idea to take this hated figure and tell things from her point of view, and to have the two witches be roommates in college, but the way in which their friendship develops – and really the whole plot – is different onstage." Schwartz justified the deviation, saying "Primarily we were interested in the relationship between Galinda – who becomes Glinda – and Elphaba...the friendship of these two women and how their characters lead them to completely different destinies." In addition to this change in focus, other major plot modifications include Fiyero's appearance as the scarecrow, Elphaba's survival at the end, Nessarose using a wheelchair instead of being born without arms, Boq having a continuing love interest for Glinda – and eventually becoming the Tin Woodman instead of Nick Chopper, the complete cutting of Elphaba's years in the Vinkus, the deletion of Liir's birth, Fiyero not having a wife and children, and Doctor Dillamond not being murdered. Mila Kunis portrays the Wicked Witch of the West, who is named Theodora, in the 2013 Disney film Oz the Great and Powerful. In this version, she is portrayed as a 'good witch', also being the younger sister of Evanora (Rachel Weisz), who is at war with Glinda (Michelle Williams) for control of Oz; she wants nothing more than for peace to come back to their land. She falls in love with Oscar Diggs (James Franco), but her feelings for him are one-sided; Theodora wanted to be Oscar's queen when he ruled Oz. After Oscar goes to meet with Glinda, Evanora tricks Theodora into thinking Oscar had betrayed her, offering her a magic apple that will help her forget her disappointment. Theodora immediately takes a bite from it, but afterwards Evanora reveals that she was the evil Witch all along, however Theodora is too late to realize this. Before she can do anything, she starts feeling great pain as the apple was tainted with a potion that removes all the good in her heart making her so evil that even her sister fears her. Her skin turns green as a side effect of the potion, while her nose becomes crooked due to her falling on it. Though Evanora offers to cover it up with an enchantment, Theodora embraces her new appearance and helps her sister attempt to kill Glinda, get revenge on Oscar, and take control of Oz. However, she and Evanora are defeated by Oscar's illusions. Theodora is forced to flee the city on her broom, but she threatens to return. Oscar tells her he knows her wickedness isn't her doing and if she ever finds the goodness within her, she is welcome to return. However, she refuses and flies off to the West, vowing revenge. The Wicked Witch appears as the main antagonist of the second half of Season Three of Once Upon a Time, played by Rebecca Mader. This version goes by the name of Zelena (which means "green" in some Slavic languages). Zelena is discovered to be the daughter of the Queen of Hearts/the Miller's Daughter/Cora (Barbara Hershey/Rose McGowan), making her the older, long-lost half-sister of Regina the Evil Queen (Lana Parrilla). Zelena visited Rumplestiltskin (Robert Carlyle) and learned from him how to control her own powerful magic. Her storyline revolves around her efforts to create a time-travel spell that will allow her to go back and prevent the birth of Snow White's mother, Ava, who informed Prince Leopold (Cora's fiancé) that Cora was with child to sabotage Cora's attempts to infiltrate the royal family (before she can ruin Zelena's life, and thus Zelena would be raised as royalty. But despite Zelena's efforts to create the deadly time portal Emma Swan (supposedly the only wielder of light magic powerful enough to oppose her) her plans are halted when the Evil Queen masters light magic in time to oppose her (although her time-travel spell is completed, it takes effect after her presumed death, transporting Emma and Captain Hook (Colin O'Donoghue) back to before the original curse was cast). She was later thought to have been killed by Rumpelstiltskin. It was later discovered that Zelena's soul actually went back in time, where she managed to revive herself and assumed Maid Marian's (Christie Laing) place after killing her in the past and taking her appearance; to allow the heroes to take her back to the present, where she poses as Marian without Robin Hood (Sean Maguire) knowing. This way, she can resume making Regina Mills suffer by complicating her romantic relationship with the believed widower Robin. Zelena also copies the other villains' idea to try to force the Author to write them happy lives at the expense of the heroes. Zelena swaps out the Elixir of the Wounded Heart and when Mr. Gold (Rumplestiltskin) is dying, saves his life with it, but only after he agrees to drop his grudge against her and begins helping her. Regina is informed of this by Rumplestiltskin himself and rushes to New York with Emma. Upon arriving there with Lily, Emma and Regina confront Robin Hood. Even though Robin Hood is now aware of what happened to Maid Marian, he couldn't leave Zelena because she is pregnant. Zelena is taken back to Storybrooke and locked in the hospital basement's asylum. Regina almost has the Author write Zelena and the pregnancy out of existence and memory. Regina changes her mind after she realizes it is something their mother would do, and she can choose to be happy with Robin and the rest of her family, raising the baby herself after the birth. When the Author warps reality to serve his own purposes, the roles of heroes and villains are switched. In the alternate Enchanted Forest Zelena is the fiancé of Robin Hood and their marriage will make all the changes permanent. When Regina is slashed almost fatally by Rumpelstiltskin, Zelena complains she is bleeding on her wedding dress and taking the attention away from her on her wedding day. She begins turning green again and runs off. When reality is returned to normal she is still pregnant in the hospital. Zelena travels with the heroes to Camelot in search of Emma after she becomes the Dark One to save Regina from the same fate. She is told to pretend to be Regina's mute handmaiden (Regina having taken her voice). In Camelot, Zelena is threatened by Regina that her baby will be taken by Regina once it has been born. She later kidnaps Mary Margaret (Ginnifer Goodwin) as the rest of the group tries to sneak into Camelot (having been thrown out) and regains her magic with King Arthur's (Liam Garrigan) help. She enchants the main hilt of Excalibur to bind Merlin's (Elliot Knight) soul, allowing its holder to control him. Zelena, Arthur and Merlin hold Emma's friends captive with the Protheum flame and the Dark One Dagger as ransom. Before she can do anything, she is tricked by Emma and tied by magic around a tree. After a battle between Merlin and Emma, Zelena transports herself and Arthur back to Camelot. Arthur and Zelena plan to take a magical helm from the kingdom of DunBroch. After many failed attempts to reach the helm, including a battle between Arthur, Zelena and Red Riding Hood (Meghan Ory), Mulan (Jamie Chung) and Merida (Amy Manson, she transports herself back to Camelot, where Emma casts the Dark Curse, ripping everyone back to Storybrooke without their memories of ever stepping foot in Camelot. Zelena awakens in Granny's Diner and is almost immediately put back in her cell. Zelena is met by the Dark Swan (name for Emma as the Dark One) and is told she will need an ally in the town after people learn the truth. Zelena eats darkly enchanted onion rings (made by Emma) and as a result, her pregnancy is sped up from two months to nine. She gives birth to a baby girl and is taken away by Emma into her basement with Hook at her side. She is freed from her cuff once again by Hook and leaves Hook in Emma's house, wanting to get answers. Zelena steps back inside after Emma finds him. She brings in an enchanted dreamcatcher, which holds the memories of Hook becoming a Dark One (in Emma's fault) in order to save him. Zelena learns that Robin and Regina are allowing her to see her baby, as long as one of them is with her. This is when she shares a bonding moment with her child. During the Dark Siege of Storybrooke, Zelena plans to take Regina's place in Storybrooke including her office. After claiming full custody of her baby, Zelena is transported by Regina (using the Apprentice's Wand) back to Oz, and she claimed they will see each other again. On Zelena's return to Oz, she confronts Dorothy, who is currently in possession of the silver slippers which can transport her to any realm. She holds Dorothy's dog, Toto, hostage in exchange for the shoes. Dorothy tries to knock Zelena out with poppy powder, but before she does, Zelena puts her under a sleeping curse. Now in possession of the silver slippers, she goes back to Storybrooke and assumes the form of the Blue Fairy to trick Belle into giving her back her daughter, who is residing at the convent with the fairies. During their conversation, a portal to the Underworld appears and Belle, holding the baby, goes through it. In a desperate attempt not to lose her daughter again, Zelena jumps through it. However, due to a sprained ankle and her diminished magic in the Underworld, Zelena is helpless as Belle runs away with her daughter. Regina reunites with Zelena in the underworld where it is revealed that Zelena and Hades have a romantic history. The sisters eventually become close as she tries to change for her daughter. She shares True Love's Kiss with Hades, which allows him to go to Storybrooke and the two go together with the baby as she believes Hades has changed. However, Hades kills Robin Hood, proving his evil to Zelena who kills him with the Olympian Crystal. She names the baby Robyn after her father. In season 6, Zelena and Regina get into a fight where Regina reveals that she blames Zelena for Robin's death; Regina's dark half, the Evil Queen has now become a human manifestation and she and Zelena work together until the Queen tries to kill her. Regina saves Zelena from the Evil Queen but does not forgive her for Robin's death. Later in the series, the town is threatened by Rumplestiltskin's mother, the Black Fairy. Zelena goes into the mines to confront her, but is held back by Regina, who does not trust her to take care of the situation. The Black Fairy takes control of the unstable magic Zelena uses to attack the fairy, and uses it to fuel crystals with dark magic. Regina takes her frustration out on Zelena after they leave the mines, and tells her to go back to Oz. In a distressed state, Zelena takes the Apprentice's wand and creates a portal to Oz, but instead of going though, she retrieves a magical artefact and uses it to take away her magic, which removes the dark magic fuelling the crystals, therefore ruining the Black Fairy's plans. After the Black Fairy's dark curse is broken, Zelena remains in Storybrooke and raises Robyn. Zelena eventually regains her magic after a confrontation between herself, Robyn, Mother Gothel and Nook (the wish realm version of Captain Hook). The Witch of the West appears as one of the main characters in the television series Emerald City, portrayed by Ana Ularu. Here she is one of the last Cardinal Witches of Oz and the "Mistress of the Western Fields, Vessel of Truth and Solace", along with her sisters Glinda of the North and the Witch of the East. West seemingly obeys the Wizard of Oz's law against magic, owns a brothel in the Emerald City and is a poppy opium addict, deteriorating her magical skill. She is very emotional, especially when compared to the reserved behavior of Glinda's. Despite claiming to hate magic because it could not save her mother and sister witches during the Beast Forever's last attack, she resorts to it quickly when in pursuit of Dorothy after she accidentally killed East. On the 1969 LP vinyl Songs from the Wizard of Oz, produced by Disneyland records, The Wicked Witch of the West is given the name "Smarmy", and sings the song "Just Call Smarmy". The record features both original songs and songs from the 1939 MGM film. In The Wiz (1974), its film version (1978), and television special (2015), the Wicked Witch of the West is given the name Evillene (portrayed by Mabel King in both the original Broadway cast and the film and Mary J. Blige in the television special). She is the malevolent ruler of the Winkies. She is the sister of Addaperle (Miss One in the film version), Glinda, and Evermean, the other three witches of Oz. In the film version, she runs a sweatshop under Yankee Stadium with the slogan "Manufacturers and Exporters of Sweat" and extracts it not only from the Winkies, but the Crows, the Poppy Girls, and the Subway Peddler. Her magic creates urban variations on the Kalidahs (depicted as evil growing dolls sent by the Subway Peddler), Fighting Trees (depicted as mobile pillars) and the wolves (depicted as living and carnivorous trash cans), all in the Subway system. She then sends the Flying Monkeys (depicted as a biker gang) to capture Dorothy and her friends. In the film, Evillene is vanquished when Dorothy sets off the sweatshop's sprinkler system, thus ending her reign over the Winkies. In Scooby-Doo and Scrappy-Doo's 1981 episode "Scooby's Trip to Ahz", the Witch appears as the Wicked Witch of the North by Southeast (suffix name spoofs the film title, "North by Northwest"). In the anime film The Wizard of Oz (1982), the Witch (voiced by Elizabeth Hanna) is purple-skinned, white-haired, and wears an eyepatch similar to W. W. Denslow's original illustration. However, her telescopic eye is replaced by a magic mirror. Her soldiers are completely magical, disappear at her demise, and are quite distinct from the Winkies, whom she uses only for labor. She wears an old-fashioned peasant dress and possesses a staff, through which she generates her magic. In the 1986 anime series The Wonderful Wizard of Oz, the Witch is purple-skinned once again, and has long white hair with a blood-like red streak. She possesses both eyes and is dressed in a long, black hooded gown. Her eyes have the power to turn people into stone, and turn blood-red when such transformations are effected. One of the Winkies actually tries to crush her to death with a huge boulder, but the Witch causes the boulder to disappear, and turns the man into stone. Like in the 1982 anime film, a magic mirror shows her everything she wishes to uncover. The Wicked Witch makes it clear to Dorothy that the Good Witch of the North's kiss cannot serve as protection from her apparently superior power, and it's the Silver Shoes that safeguard the girl. The Witch also reveals that the Wicked Witch of the East was her sister, and that the Silver Shoes could triple her own powers. This version gives the witch the most prolonged and dramatic death scene of all versions; it also differs from previous adaptations by suggesting that Mombi was her protégé. In the animated series The Wizard of Oz (1990–1991) by DiC Enterprises, the Flying Monkeys that were loyal to the Wicked Witch of the West (voiced by Tress MacNeille) perform a ritual that resurrects the Wicked Witch of the West where they place her hat, dress and cloak on an effigy. Afterwards, she terrorizes Oz again by tarnishing the Emerald City, stealing what Dorothy's friends treasure the most (the Scarecrow's brain diploma, the Tin Woodman's clock heart, and the Cowardly Lion's medal of courage), and making the Wizard fly off-course in his hot-air balloon by creating an evil wind. Of course she still has a weakness to any type of water causing her to evade at all times. This incarnation of the character was clearly based on the 1939 MGM movie, to which the series itself served as an unofficial sequel. Although the witch's garments are purple here rather than black. The Witch appears in a little-known 1995 version of the original story made for British cable television, which combined elements of Baum's original story, the 1939 movie, and the 1985 semi-sequel Return to Oz. She first appears after Dorothy lands in Oz, demands to know where the Ruby Slippers are, threatens Dorothy, then leaves. The Munchkins then reveal they hid the Slippers to keep the Witch from getting them, force them onto Dorothy, who then leaves to find the Wizard. At the end of the film, after taking the Slippers while Dorothy is sleeping, the Witch turns her loose in a room full of large rocks, says she's turned Dorothy's companions into rocks themselves, and will give her three chances to pick which ones are her friends, but if she guesses wrong, she will become one herself. To be fair, she turns the Slippers into a rock and hides them in the room. Dorothy, however manages to find the Tin Woodman, Scarecrow and Cowardly Lion. The Witch, enraged, grows to giant sized and holds a boulder over Dorothy, who then finds the Slippers and wishes for the Witch to lose her power. The Witch loses her strength and falls backwards, and the boulder kills her instantly. In the 1995 television special The Wizard of Oz in Concert: Dreams Come True (a stage musical based on the 1939 film), Debra Winger portrays the Witch. Her costume is green rather than black. In addition, Winger narrates the tornado scene including Miss Gulch's transformation. This production omits the scene where the Witch threatens Dorothy, the Scarecrow, and Tin Man as mattresses and a beehive after appearing on top of The Tin Man's cottage. The Wicked Witch's Castle scenes are shortened due to time limit. Unlike Margaret Hamilton, Winger says the line "What a little whiner! I'll give you something to cry about" when Dorothy suffers her imprisonment after Aunt Em's image fades away in the crystal ball rather than "I'll give you Auntie Em, my pretty!". In the February 1996 episode "Water You Thinking?" of Mighty Morphin' Alien Rangers, a witch monster appears by the name of Witchblade and she seems to be modeled after the Wicked Witch. Her voice and cackle are reminiscent of the 1939 film's portrayal of the Witch. Additionally, most of her lines are paraphrasings of the Witch's lines, such as "How 'bout a little fire, Rangers?". She also refers to the Rangers' Zords as "Tin Men" and to the Rangers as "My pretties". When she's defeated, she cries "Oh, no! I'm falling, falling! What a world!" In "Anthology of Interest II", a 2002 episode of the animated television series Futurama, Leela is knocked unconscious and dreams about being Dorothy in a version of The Wizard of Oz, with Futurama characters playing the roles of Wizard characters. While Fry is the Scarecrow, Bender the Robot is the Tinman, and Doctor Zoidberg is the Lion, the Wicked Witch is played by Mom, a recurring antagonist from the show, voice by Tress MacNeille who also provided the voice for The Wicked Witch of the West in the 1990 DIC animated series. The Witch sends her flying monkeys, played by Mom's sons Larry, Walt, and Igner, to capture Dorothy/Leela. At the Witch's castle, she reveals that she wants to adopt Dorothy as her daughter, and Dorothy/Leela agrees, as long as she gets to be a witch, too. The Witch/Mom meets her fate when Tinman/Bender opens a celebratory bottle of champagne and accidentally sprays her with it, melting her. Later, after Dorothy/Leela uses the power of her ruby boots to become the new Wicked Witch of the West, water splashes down on her from the ceiling, causing her to melt as well, to which the Cowardly Lobster/Zoidberg descends the stairs, mentioning "I think there's a problem with your upstairs toilet." In The Muppets' Wizard of Oz (2005), Miss Piggy plays all of the witches of Oz, including the Wicked Witch of the West. Her basic attire evoked W. W. Denslow's original illustration, with a biker theme. The eyepatch also covered a magical glass-eye that gave her visual powers. This version of the Wicked Witch is only vulnerable to tap water where she is able to bathe in bottled water. The Wicked Witch of the West is vanquished when Dorothy kicks her into the bathtub filled with bottled tap water since Angel Marie filled the bottles with tap water. Afterwards, Dorothy salvages her glass-eye which is later given to the Wizard of Oz. Miss Piggy's other role is herself. Prior to Dorothy's journey, she appears with Kermit and tries to get rid of Dorothy. After Dorothy's return, she returns for the Muppets' show. In the American television show Supernatural, the Wicked Witch appears as the villain of the episode "Slumber Party" where she comes to Earth in 1935 with a plan to get the Key to Oz and bring her army to Earth to take over. Dorothy Gale, who is in fact the daughter of L. Frank Baum, becomes a monster hunter to stop the Witch after she spent some time trapped in Oz with the resistance- the leaders being cursed to transform into the Scarecrow, the Tin Man and the Lion- but is unable to kill her, eventually forced to simply trap herself and the Witch in a jar in the Men of Letters Bunker until someone else can work out her weakness. When the two of them are accidentally released in 2013, the Witch begins searching for the Key to continue her plan, the protagonists initially only able to wound the Witch with bullets made from poppy seed extract. She possesses Sam and Dean Winchester to kill Dorothy, whom she can't hurt due to the blessing Dorothy received from Glinda upon arrival, but is killed by Charlie Bradbury with the Ruby Slippers when Dorothy identifies them as possessing Oz magic and being suitably sharp. In the October 2007 VeggieTales episode "The Wonderful Wizard of Ha's", the witch and her Kansas counterpart from the 1939 film are replaced by Chester the Bully (Kansas) and Bobby the Bully (Wonderful Land of Ha's), both portrayed by Gourdon from "Bully Trouble". In the December 2007 Syfy miniseries Tin Man, the character of Azkadellia (played by Kathleen Robertson) is analogous with the Wicked Witch of the West, though she is vastly different from most other versions of the character. In the miniseries, she is portrayed as a member of the Royal Family of the O.Z. (Outer Zone) who is possessed as a young girl by the spirit of the evil Witch of the Dark (Karin Konoval) who uses her body to take over the O.Z. and plunge it into a world of permanent darkness. This adaptation's version of Dorothy Gale is Azkadellia's younger sister DG (Zooey Deschanel). Both of the sisters are powerful witches themselves, though DG has to relearn all of her magical abilities, and once DG frees Azkadellia from the witch's grip, both of them defeat her together. Although it is clear that Azkadellia is analogous with the Wicked Witch of the West, it is implied vaguely that the Witch of the Dark is the Wicked Witch that Dorothy, who makes an appearance as a spirit in a mausoleum, defeated in the original story. In Dorothy of Oz, a Korean manhwa (produced 2008 or earlier) by Son Hee-Joon, the Witch of the West is re-imagined as a scientist who rules over the Western Dominion. She is psychopathic and cruel, and in a twist, she (not Mara/Dorothy) is the true orchestrator of the death of the East Witch Selluriah. She is the creator of an army of clones, one of whom is the story's equivalent of the Scarecrow. Whether or not this is a reference to the musical Wicked is unknown. The Wicked Witch of the West appears as the primary antagonist of the 2011 television miniseries Dorothy and the Witches of Oz, played by Eliza Swenson. In flashbacks, it was seen that she had obtained the mystical Book of Mini Aru (which contained the Changing Word) from the Wizard as part of a deal not to continue her attack on Oz in exchange that the Wizard doesn't plan to reclaim the book. Unfortunately for the Wicked Witch of the West, the Wizard entrusted the key to the Book of Mini Aru to Dorothy for safekeeping. On Earth, she assumes the form of a female book publishing agent named Billie Westbrook and plans to obtain key from Dorothy so that she can lead Princess Langwidere, the Nome King and an army of winged monkeys, Nomes, and dragons into taking over Earth upon learning the Changing Word. The Wicked Witch of the West also had plans to invade Wonderland, Neverland, Camelot, Narnia, and Shangri-La. The Wicked Witch of the West has a cameo appearance in Legends of Oz: Dorothy's Return during one of the Jester's songs. The Jester is presented as her brother who was cursed to be trapped in a jester's costume by the Witch with Glinda noting that she didn't know the Witch had a sense of humor. The Wicked Witch of the West appears as a boss character and playable figure in the video game Lego Dimensions, voiced by Courtenay Taylor. She is the only playable character from the Wizard of Oz franchise. During the video game's story, Batman, Gandalf, and Wyldstyle face off against the Wicked Witch of the West and were able to defeat her with water and steal the Shift Keystone from her. Her hat is later salvaged by Lord Vortech. The Wicked Witch of the West appears in Tom and Jerry and the Wizard of Oz, voiced by Laraine Newman. The Wicked Witch of the West appears as one of the villains in The Lego Batman Movie, voiced by Riki Lindhome who was uncredited for the role. She is depicted as an inmate of the Phantom Zone, the group of which is known as the Ubers. Upon Joker proposing his plan to escape the Phantom Zone and help him invade Gotham City and defeat Batman, the Wicked Witch of the West tells Joker "We're listening." When Harley Quinn steals the Phantom Zone Projector from Arkham Asylum's evidence locker and frees Joker and the Phantom Zone inmates, the Wicked Witch of the West unleashes the Winged Monkeys to fly around and cause mayhem in Gotham City where Robin kicks them off the Bat-Plane. The Wicked Witch of the West also infiltrates Wayne Island along with Joker, Harley Quinn, and the other Phantom Zone inmates. She is defeated by Team Batman and their enemies in the end and sent back to the Phantom Zone. The Wicked Witch of the West appears in Dorothy and the Wizard of Oz, voiced again by Laraine Newman. After she was melted, her spirit was imprisoned in her crystal ball. The Wicked Witch of the West had to have her niece Wilhelmina (voiced by Jessica DiCicco) and the flying monkeys on her niece's side scheme to steal the Ruby Slippers that are needed to restore her. ^ "AFI's 100 Years ...100 Heroes & Villains". ^ "90. The Wicked Witch of the West". Empire. Retrieved 4 December 2010. ^ "Once Upon a Time: Rebecca Mader Is Playing The Wicked Witch of the West! See the Incredible First Photos". E!. December 15, 2013. Retrieved March 11, 2014. ^ "Zelena". ABC. Retrieved 22 November 2015.